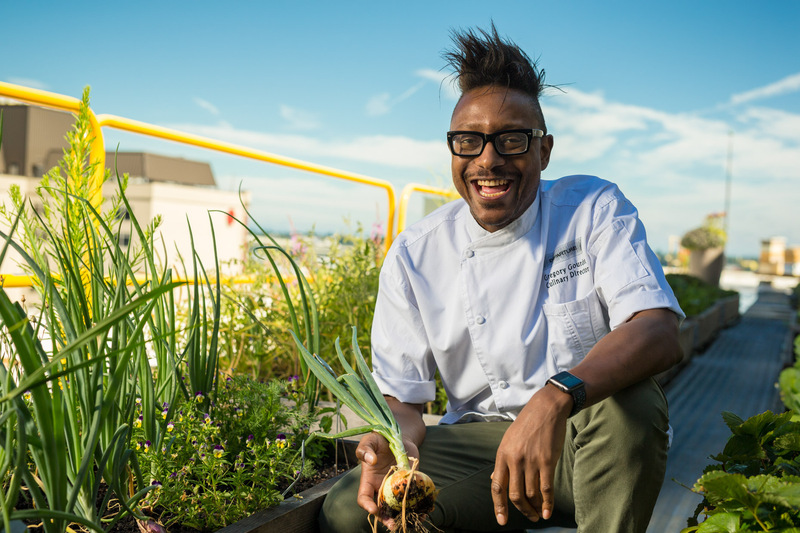 GREGORY GOURDET doesnât have his own cooking show on television, but heâs as close to a celebrity as a chef can get. In the past four years, the 41-year-old, who lives and works in Portland, has been on the âbest ofâ chef radar for the Northwest food scene. His innovative use of local ingredients at Departure, where he is the executive chef, has earned him accolades including âChef of the Yearâ from the Oregon Department of Agriculture in 2013 and Eater Portland in 2014. e James Beard Foundation named him a semi nalist for Best Chef: Northwest and he took runner-up on season twelve of Bravoâs hit series Top Chef in 2015. 1859 Magazine hired celebrity entertainment and portrait photographer Andy Batt to create this fantastic image of the chef in his rooftop garden.